The project is old so PIXI v.3.0.11 is used. 2. 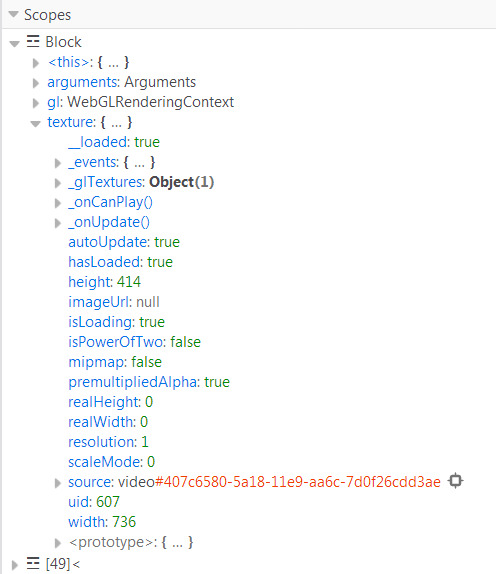 When stream fires STREAM_PLAYING event the method PIXI.Texture.fromVideo(streamHtmlVideoElement) is called and the returned texture is set to the specific PIXI.Sprite instance. tried to set video.crossOrigin = "anonymos" to the video element but no success. I know it's not directly linked by PIXI but still I need help. And the image of the current block when exception was thrown. > I know it's not directly linked by PIXI but still I need help. That looks like a CORS problem. Can you check what network headers the video (and possibly related preflight request) have in relation to access control? That looks like a CORS problem. Can you check what network headers the video (and possibly related preflight ﻿request) have in relation to access control? The only headers I can access is the updgrading protocol request/response (from http to ws) wich does not contains any valuable information. After this the connection is opened between my client and the server. The client receives only socket messages like stream events - PLAY, FAIL and etc. I cannot inspect the WebRTC headers and messages at whole. Also cannot find any tool that can do this. The problem is happening very rarely and it is in Firefox only. So in one moment I decided to stop believing it is CORS problem for that reason. And only WebGl has problem. The stream(video element) is not failed or something. Do you draw something else than the video to canvas? If something taints a canvas then it stays tainted no matter what is rendered in the future. Or it might be due to stream becoming unavailable at some point for short duration and that could cause tainting (though the bug report I found on this should be already resolved, it was 5 years ago). Pretty sure it's some kind of edge case in security constraints which causes canvas to become tainted (by something), which causes security error when pixels are read from it. Said in that way sounds very trustworthy. Okay I will make more research around. Think the Firefox forum will be affected too. Thank you very much! I will write when something new emerges on the horizon ! You could create a simple test case where you have a canvas, you draw the video there and then read a single pixel from it. If it gives the same error, then the video causes tainting. If not, then it's something else.